Scientists have discovered an unprecedented depletion of the Earth’s ozone layer in the Northern Arctic region. A NASA-led study released on October 2 in the journal Nature reports that a loss of ozone similar to the one found in the Antarctic has begun to develop due to a prolonged period of low temperatures. The Ozone layer is the stratosphere, extending from about 10 to 20 miles (15 to 35 kilometers) above the surface of the Earth. Ozone is a molecule made up of three-oxygen-atoms that absorb 97 to 99-percent of the Sun’s ultraviolet rays. The Ozone layer suffers some amount of damage every winter, as the cold temperatures cause ozone-destroying forms chlorine to be converted from human-produced chemicals. "The difference from previous winters is that temperatures were low enough to produce ozone-destroying forms of chlorine for a much longer time,” said lead author of the study Gloria Manney, of NASA's Jet Propulsion Laboratory, in a press release. "This implies that if winter Arctic stratospheric temperatures drop just slightly in the future, for example as a result of climate change, then severe Arctic ozone loss may occur more frequently." In the study, the scientists found that cold periods in the Arctic lasted for 30 days longer than they did in a previously studied winter. Scientists from 19 institutions in nine countries investigated the 2011 Arctic ozone loss that occurred last winter and spring. The study included daily atmospheric observations from NASA's Aura and CALIPSO spacecraft, Ozone measurements with instrumented balloons, and meteorological data and atmospheric models. The total loss of Ozone in the Arctic was over double the typical amount in the Antarctic, but the area of loss was 40% smaller. 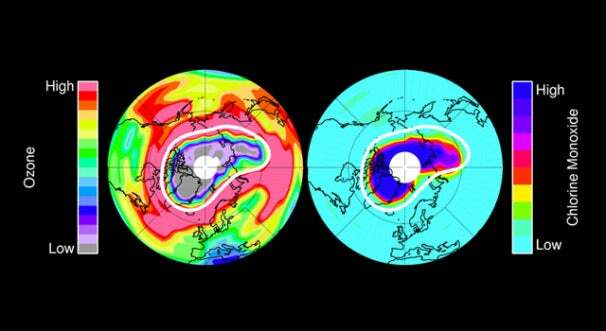 Ozone depletion occurs in an atmospheric cyclone system known as an Arctic polar vortex. Whereas the Antarctic vortex is larger and longer-lived, the northern vortex is smaller and shorter, but it is also mobile and often moves over densely populated regions, potentially endangering humans to direct UV exposure. Artificial Photosynthesizers Render Plants Obsolete (Take That, Nature!